Staff Sgt. Ashley Majewski, 86th Dental Squadron oral preventative assistant, cleans the teeth of Senior Airman Jordan Burge, 86th Munitions Squadron tactical air munition rapid response package technician, during a routine appointment at the dental clinic Feb. 8 on Ramstein Air Base. Majewski said it’s rewarding to clean off a patient’s teeth and watch them walk away like a brand new person. A beam of light strikes a metal hook as it grinds against the surface, chipping away at the grime that clings onto the ivories. Just as the technician’s hands start to cramp, the cleaning is finished and the beam of light reflects off the pearly white teeth like an eclipse over a still ocean. This is one of many tasks 86th Dental Squadron Airmen perform multiple times a day. Between exams, cleanings and creating prosthetic teeth the dental clinic stays busy, ensuring service members are healthy. “We cover all of the active-duty (service) stationed at Ramstein, and we also service people who are in Africa and all of Europe,” said Staff Sgt. Ashley Majewski, 86th DS oral preventative assistant. Last year, the 86th DS gave exams to 9,304 active-duty Air Force members, had 43,690 patient visits and had a total of 132,916 procedures — all with a staff of 87 enlisted members, 32 officers and 17 civilians. Despite the busy schedule, Majewski has a positive outlook on working in the dental clinic. While morale is a contributor to Majewski’s positive outlook, she genuinely enjoys doing the job. “It’s great to have a patient with a ton of tartar and then clean (their teeth), because they leave like a brand new person,” said Majewski, describing a rewarding part of the job. Scraping plaque and tartar off the teeth of KMC members isn’t the only thing the dental clinic does though. There are plenty behind-the-scenes Airmen who add to the clinic’s mission effectiveness. 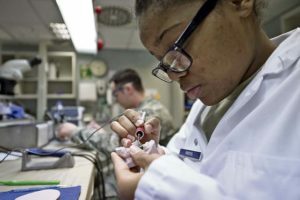 Airman 1st Class Jada Rivers, 86th Dental Squadron dental laboratory technician, fabricates a tooth for an implant at the dental clinic Feb. 8 on Ramstein Air Base. 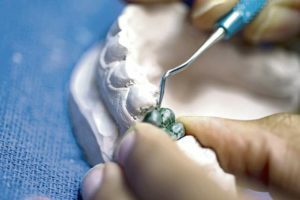 The base dental laboratory specializes in making dental appliances to include dentures, crowns, and mouth guards. Whenever a patient needs a new set of teeth or a mouth guard to protect them, base dental laboratory is on the case. On average, the dental lab receives more than 250 submissions a month. 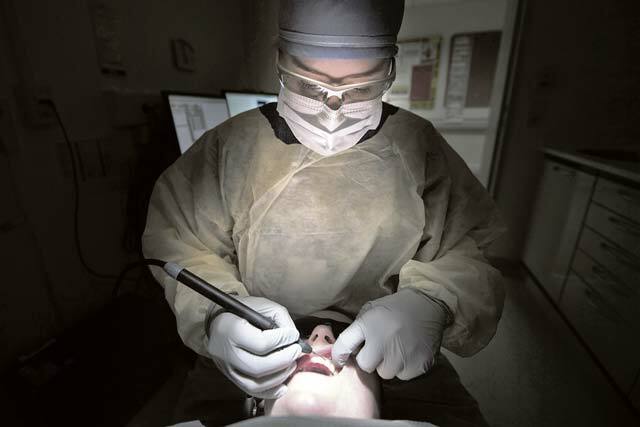 Airman 1st Class Jada Rivers, 86th Dental Squadron dental laboratory technician, fabricates a tooth for an implant at the dental clinic Feb. 8 on Ramstein Air Base. On average, the base dental laboratory receives more than 250 submissions a month. Whether it’s the lab technicians making teeth from scratch or oral preventative assistants polishing up patients’ pearly whites, the Airmen at the 86th DS keep on keeping on.